Latest happenings within, or of interest to, our group. Well, it’s official: the paperwork came through for the NFRFE grant we applied for back in February! We will try to leverage cancer hypermutation for genetic engineering purposes. Exciting times! Welcome to our TMM rotation student Jasmine Bhatti! Jasmine is working on mutational signatures in bacteria. 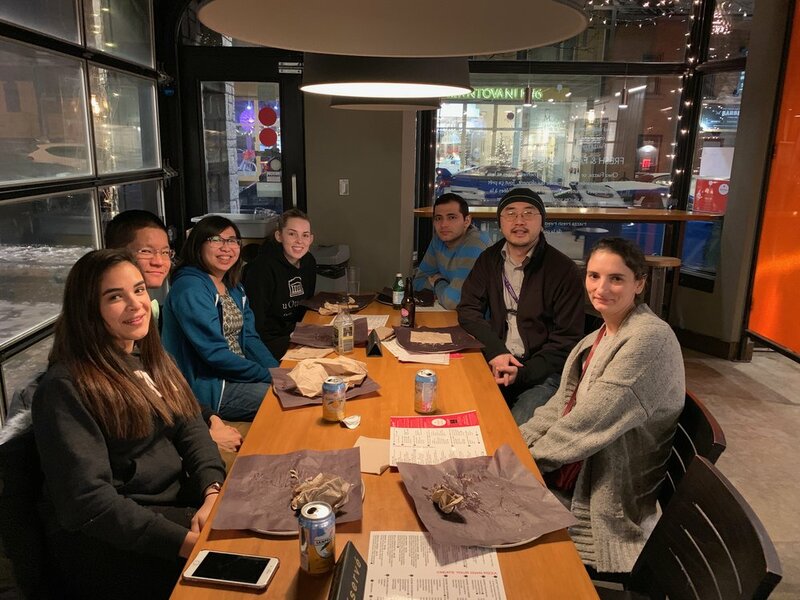 We all went for a nice holiday pizza dinner at Fiazza in Byward Market two evenings ago. We got to celebrate Bledar and Reena’s very successful committee meetings. It was also fun to catch up with Kassidy and Salma. We had a very good campaign in 2018, and we’re looking forward to more success in 2019! Warmest welcome to our newest lab member, Dr. Suzana Gelova! Suzana will be the point person for our endogenous metabolism project. Welcome aboard! I feel honoured and privileged to have participated in the inaugural Science Meets Parliament event these past two days. 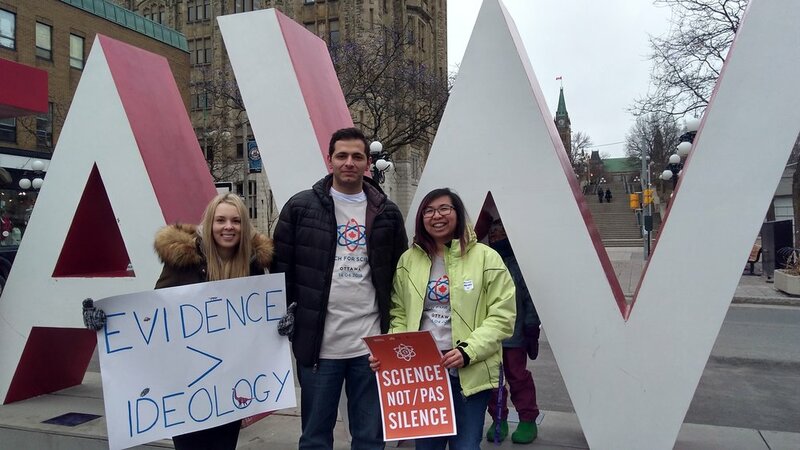 29 scientists in a broad range of fields around the country came to Parliament Hill to get to know MPs and Senators. Thank you to all the parliamentarians for their support of science and for being such gracious hosts! After meeting the parliamentarians, I’ve certainly got a much better understanding of their jobs and how much hard work they put in, day in and day out, to serve the public. Their schedules are jam packed with meetings, committee work, votes, phone calls, media availability, etc etc. I’m very impressed with MPs’ and Senators’ mental agility, to switch gears between different topics from one thing to the next every half hour, every day on the job! I’m hopeful this will kickstart ongoing dialogs between scientists and policymakers. Thank you to the organizers for putting together such a successful event and to my fellow scientists for their enthusiastic participation. You can find all tweets related to this fantastic event by searching the hashtag #SciParl2018! Our first Honours BSc student, Salma Alasmar, was awarded best honours project in the Biopharmaceutical Science undergraduate program. Way to go Salma, and all the best with your graduate studies in the Chemistry Department! Nathan Liang, our TMM student, was awarded an NSERC Undergraduate Summer Research Award (USRA). Well done and congratulations to Nathan! It's hard to believe we're almost into March already! Between bench work, mentoring students, writing chores, peer review assignments, and a little teaching, January and February have just flown by. We're happy to welcome Nathan Liang into the group. Nathan is a TMM rotation student, who is also planning to stay on for the summer and into his honours project next fall. He will be working on various aspects of endogenous mutagenesis. Welcome aboard! We're also happy to learn that Kassidy and Salma will be moving on to their first choices for post-baccalaureate education. Kassidy has been accepted to the uOttawa law program (and awaiting word from other programs in Ontario), while Salma has been accepted to the chemistry graduate program. Both have made important contributions to our ongoing research. As group leader, I always encourage students to pursue what they're most enthusiastic about, and I'm very glad Kassidy and Salma have found great situations for the next steps in their respective career paths. Fall 2017 was a successful semester for everyone in the group. We've made progress with all projects. Reena and Bledar applied for multiple scholarships and successfully conducted their first thesis advisory committee meetings. Salma and Kassidy continue to make important contributions on multiple fronts. Our inaugural holiday dinner was good fun. Winter Break is a welcome pause to refit and recharge. Looking forward to a great 2018! And so, the new school year has begun! Welcome to our MSc students, Reena Fabros and Bledar Xhialli. And we welcome back our undergraduates, Salma (starting her honours project) and Kassidy. Aisha is moving to Dr. Bernard Jasmin's group for her honours project. We've got exciting preliminary results on the mutation signature from metabolism and we're launching new projects. It's going to be a great year ahead!